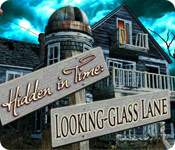 Hidden in Time: Looking-glass Lane is rated 3.5 out of 5 by 25. Rated 5 out of 5 by saintelmo from Extra Long I really enjoyed this game. It is long and entertaining. The graphics are very good and the clues are fun. I wish more games were like this one. Rated 5 out of 5 by sapoe from a game for my lazy time. I played this one when it first out and yes, I'm kinda have fun 'til end! (I never leave a review before) I give it five star because at the time I was so bored and this game could kill my lazy time. Well, I think it's a good sequel but "so-so". If you feel so bored, try this game. Afterall, thanks dev and keep work hard! Rated 5 out of 5 by Snowview from Great location and characters, whimsical story I'm a sucker for games set in the wild west and I was happy to enjoy many other aspects of this game as well. It's close to being a straight HOG rather than adventure because its one HOS after the other, broken up by puzzles and a few adventure-like interactions. The story was engaging and I loved the fact that although there were ghosts involved it wasn't horror-genre and dark like so many HOGs. Every chapter involved interaction with a new interesting character. The objects were clear, interesting and attractive. I especially loved clicking on the animals in the scenes to hear the noises and shooting the cans. After you finish the game you can play the whole thing with images reversed, which I'm doing now, just to return to the western scenes and shoot all the cans this time! Rated 5 out of 5 by pamhamlet from Good, engaging storyline This was an intriguing time travel mystery story which held my interest and I actually cared about helping the protagonist get her time machine working again to save her granddaughter and all the other train passengers. It is a ghost story, but not frightening or spooky. Perfect for moms and daughters to play together. I give it 4.5 stars. THINGS I LIKED: Find and shoot the tin can in every HO scene. Find the mirror to gain extra hints. Solving puzzles without skipping also gains you extra hints. I appreciated the well-thought out adventure and how it all comes together (even if it was far-fetched!). 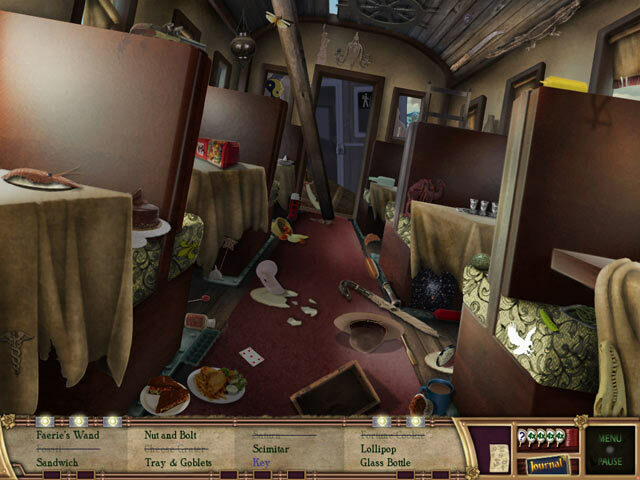 The story has a logical flow as you move around town accomplishing your tasks. You do not have freedom to explore wherever you wish, but you do enter every building and room in town sequentially, as it is appropriate to your quest. Some places you do revisit. The graphics are nicely done: pretty scenery in a ghost town setting. I also appreciated the good use of spelling and grammar when reading dialog, notes, and journal pages. So refreshing! I did not find the objects in the HOSs tiny or overly hard to find. They are easily recognizable and I never got frustrated. In fact, I only had to use 2 or 3 hints in the entire game to find objects. But I tend to be very patient and don't like to rush through my games. The HO scenes are interactive---some items are completely hidden under or behind other things, so you may need a tool to uncover them, but the cursor changes shape and makes a faint click noise as you run it over those objects, so it helps you find them. You can also use your hints if needed. If you unlock the "Mirror-Mirror" gameplay at the end, all it does is replay the exact same game all over again, only everything is facing the other way, as if you held a mirror up to your screen and saw the scene and house from that perspective. I assume this should probably add to replay value. Otherwise, all game play remains the same. THINGS NOT LIKED: If I had anything bad to say about this game at all, it would be the many HO scenes. For those who love them, you are in luck. Regardless of their number, the HOSs and mini-games were fun and not overtaxing...no penalties and lots of hints, so I still found them enjoyable. A satisfying game overall. Rated 5 out of 5 by MrsJayneCobb from Cans of Fun! 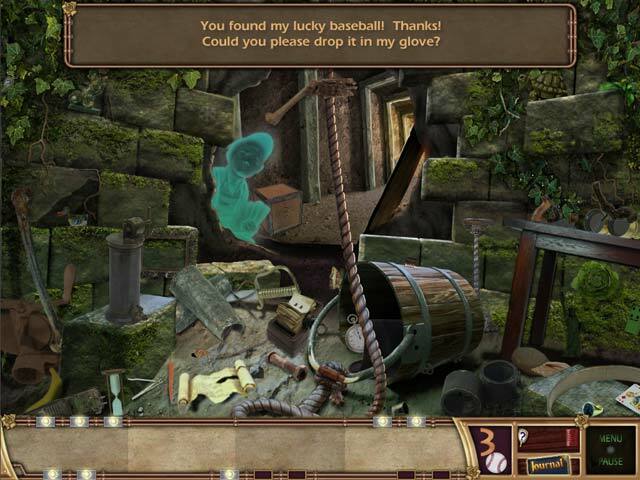 I really enjoyed this game because it was more than just a hidden object search. 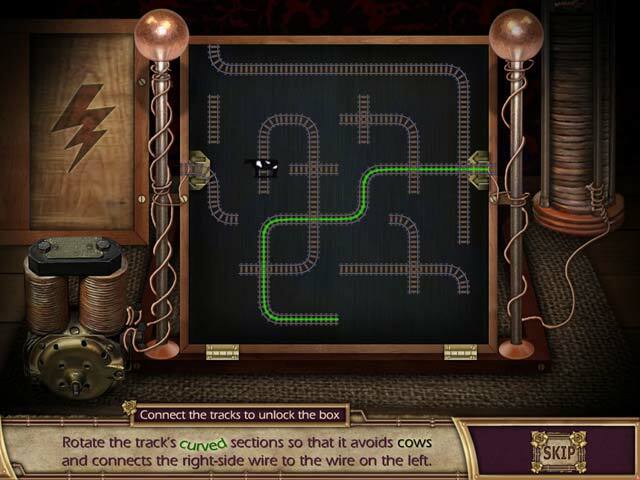 The only aspect I wasn't into was the side game of connecting the railroad tracks to form a complete circuit. *shrug* Either way, I loved the story line and found the graphics detailed and of excellent quality. Rated 4 out of 5 by gamefan10 from A fun game I really liked playing this game. It's mostly hidden objects. Each HO scene has two other things to find also, a tin can and a hint button. You can collect several hint buttons which will help you to find those objects that are very hard to find. The story behind this game is interesting. A woman was somehow manipulating time and accidently sent quite a few people on a train into a different time. She has asked you for help in getting them back to the present time. At the end of each area you find a time box that has to be placed in a certain spot on a round table. When you've found all 12 boxes then the time mistake will be corrected and the people from the train will be able to return home. The game is kept interesting by having some variety in the HO scenes. Sometimes you have to open a drawer, sometimes move something out of the way, sometimes go into another area and get something you need, and so on. I definitely recommend this game!